Camera company Ricoh has released an iPhone app that allows users to send photos and videos straight to each others' handsets. The app is actually intended to allow you to access an online storage system called Quanp, which sounds like some seedy character out of a Dickens novel and is a Dropbox-style service. 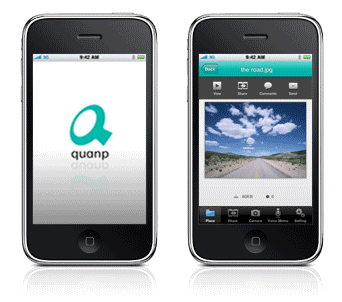 Ricoh owns Quanp and is pitching it as a photo sharing system that keeps Windows machines, Macs and iPhones in sync. However, Quanp the app has a "Flick File" feature which pings pictures from one iPhone to another even if you're not signed up to Quanp. Apparently, you literally flick the picture off the screen of one iPhone - or iPod Touch - and it appears on the other. We couldn't try it out, because the app hasn't yet appeared in the UK app store - we presume it'll do so shortly.